PappaRich is a Malaysian group of restaurants that first started in Kuala Lumpur, Malaysia in 2005. Over time it has become a very successful business and has taken off like a rocket in Australia. In Australia, they started in Melbourne (reputedly populated with more Malaysians than any other major city in Australia) which now has up to 5 outlets and in April they wet their feet in Sydney by opening up an outlet in Chatswood. Stating that it has been a successful opening in Chatswood is an understatement. The queues have been long and sometimes people have had to wait for up to 45 minutes to an hour to get a table. So for my first venture to the Chatswood outlet, my friend CW and I decided to get there right smack at the opening time of 11.00 am on a Saturday. Even then, there were about 10 people ahead of me waiting for the doors to open. Goodness!!! Joining us were CW's 2 daughters and 3 of her ex classmates from Malaysia. We were all hungry and definitely wanting to try out different dishes. Before I start describing the food, I think I should explain the food ordering system at PappaRich. There is a preprinted list of menu items on a block pad and we diners get the time to peruse the very extensive menu and note which ones we want and the number of plates for each dish ordered. When we are ready, we press the bell button which is located in the centre of the table. Someone will come around to pick up the order. For drinks, I had the Barley with Grass Jelly. An interesting combination, one which I have not tried before and I quite liked it. 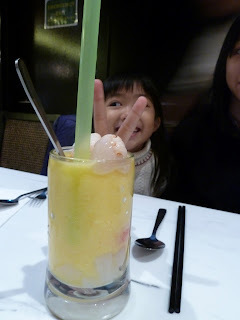 The girls had the Mango Mania, it was quite a colourful looking drink. For desserts, we were feeling quite full so we decided to share 2 desserts among us. Verdict: There were some hits and some misses. Personally I enjoyed the Nasi Biryani dishes and the Crispy Egg Noodle was good too but it could have been accompanied with some pickled green chillies. I wasn't too keen on the Dry Kuay Teow dish and the Char Kuay Teow could have had more chilli to the mix and it lacked the wok hei that we Malaysians look for in this dish. 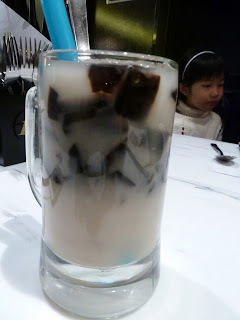 I found a prevalent taste of sweetness throughout most of the dishes, which is something I am not used to. But yet this place is packed to the max, there are queues galore and most of the patrons are actually from Malaysia, Singapore and other SEA countries. The key to their popularity could be due to the reasonable prices, the extensive menu range and the food is I suppose good enough but not necessarily the best? Wow, seems to be a very popular joint. The dishes look pretty good, will have to give this a go when the crowds die down a bit.